Ryobi meets pink rose! Not staged, this is where I found Doug's drill, flirting with my vase of flowers. Doug builds, I beautify. Now for the ugly. These are from the garage roof. There were 5 or 6 layers! The new room's roof will sit partially on the garage roof, so the old shingles had to come down. Doug and I filled numerous garbage bags with these VERY HEAVY shingles. Not fun. Doug is sweeping the debris of the garage roof. Still more work remains to get down to the plywood. The new room roof is taking shape. A minor miscalculation, so Doug is cutting more roof shingles. Where's Doug? Is there a King's game on television? Doug's work table at the end of the day. Wood for the roof is ready to go. We'll put a lid on the new room soon! Most people have lounge chairs poolside. We have 2 x 4's! Well, I can't end this post with a photo of building materials....so here's a photo of how I beautified Doug's workspace. This drives him "nuts!" At night, I light these candles and dream of the day our project is completed! Yes, it's time. Time to build, time to create. It's been awhile since our home has seen ladders. This post is the first in a series beginning with an unused space longing to be more. A challenge for Him, a dream for Her. We begin with a space, a pass through really, between the garage and our house. A white wood deck that could...should...will...be more. Our former pass through now needs another ingress/egress. So, we begin with new steps. A few days later, construction of the stairs is done. Doug also built a gate for the stairs, but somehow I missed taking a photo of the gate. Paint comes later. Of course, no project is built in a vacuum. Thus, the stairs and ... an extension of our fence. A long fence needing paint. Another project, of course. WHAT A CHARMING COVER! WHEN I RECEIVE MY SHIPMENT I'LL POST MORE PHOTOGRAPHS. IF THE COVER IS AN INDICATION OF WHAT'S INSIDE THIS ISSUE, WE'RE IN FOR A SPECIAL TREAT! EVERY READER, INCLUDING ME, WILL WANT TO BUILD A FABRIC TENT UNDER A TREE! 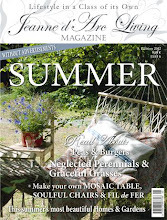 OH, AND BY THE WAY, THIS ISSUE IS SOLD OUT ON THE JEANNE D'ARC LIVING WEBSITE! 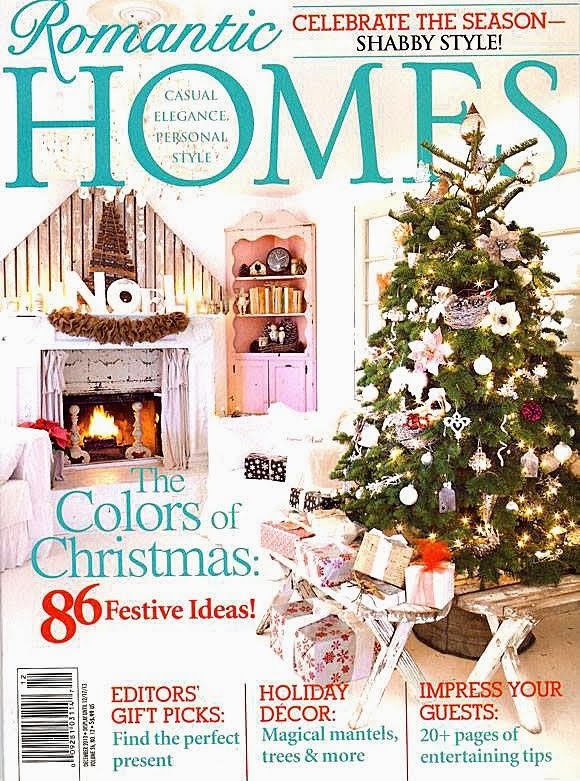 A MUST HAVE MAGAZINE THAT WILL HAVE YOU DROOLING, DREAMING AND DECORATING SIMULTANEOUSLY! A BOOK QUALITY PUBLICATION THAT YOU'LL REVISIT AGAIN AND AGAIN. DEFINITELY A KEEPER! 144 QUALITY RECYCLED PAGES OF WOW! 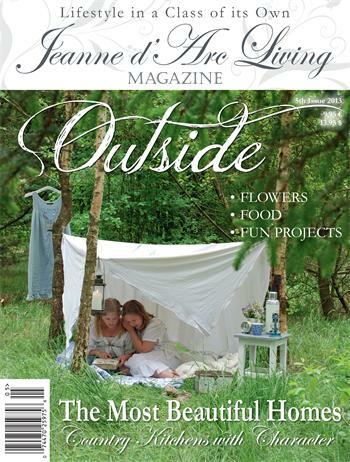 HERE ARE JUST SOME OF THE ARTICLES FEATURED THIS BEAUTIFUL ISSUE: OUTSIDE FLOWERS, FOOD AND FUN PROJECTS! COUNTRY KITCHENS WITH CHARACTER! AND OF COURSE, BEAUTIFULLY DECORATED HOMES! PHOTO AFTER PHOTO OF AMAZING FRENCH NORDIC DECORATING IDEAS, RECIPES, FLOWERS AND PRODUCTS FOR SALE. NOW OFFERED 12 TIMES A YEAR! THIS PUBLICATION HAS TAKEN THE USA BY STORM PROMPTING THE ORIGINAL DANISH TEXT TO BE TRANSLATED INTO AN ENGLISH VERSION. GET YOUR COPY NOW BEFORE THIS ISSUE IS SOLD OUT. ONCE AN ISSUE IS SOLD OUT, IT'S DIFFICULT/IMPOSSIBLE TO FIND LATER. MY MOM IS FEATURED IN ROMANTIC HOMES MAGAZINE! 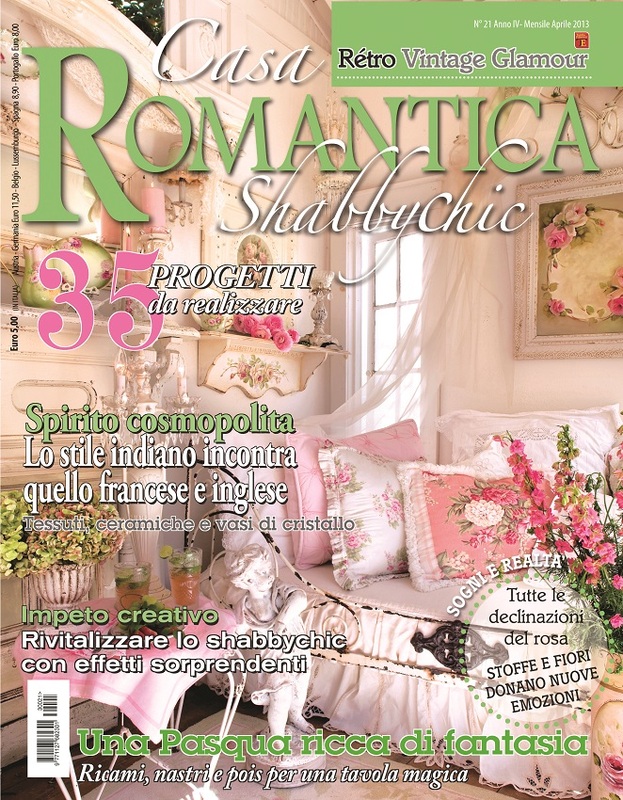 Have you seen the May 2013 issue of Romantic Homes magazine? There have been many amazing covers in the past, but this cover is one of my all time favorites. I lovingly call it the "PINK" issue, timed perfectly for Mother's Day. Of course, I adore the color pink. After all, I named my .com "cute pink stuff." Diving in now...I told Jacqueline that my 93 year old arthritic mom crochets dish cloths ... pink ones for my .com. The PERFECT Mother's Day gift from my mom to yours! Jacqueline agreed. Fast forward to the production line. My mom is a one woman operation. She's been crocheting a lifetime and has the tenacity of a race horse, but her age and arthritis determine how quickly she can produce quantities of dish cloths. When I sent my mom a boxful of pink yarn, her response was, "Cindy, I'm not a machine." My mom has a sense of humor, too. ...and she says she's not a machine! The "PINK" issue is on stands April 9. 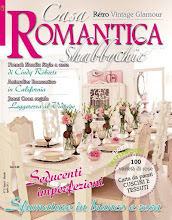 Ladies who subscribe to Romantic Homes, including me, received their copy a week earlier. You'll LOVE this issue, I promise. She can add this to her resume of accomplishments alongside her greatest feat: warm- hearted, loving mom. 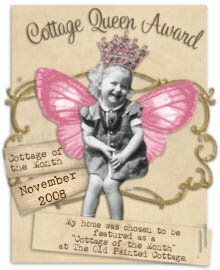 I'd love to share my mom's joy and creativity with you! 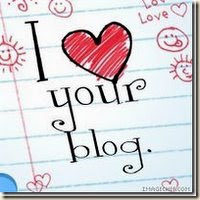 Please stop by my .com to see the many photographs I've taken of my mom's crocheted treasures. They are truly handmade gems from a past generation thriving in a modern world. All proceeds go to my mom! 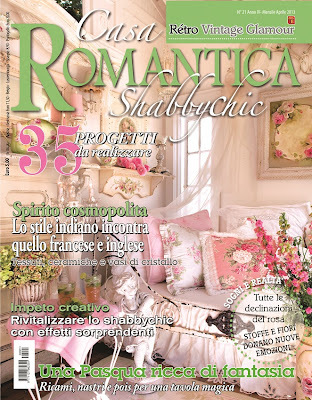 A box arrived on my doorstep from Italy....filled with the April issue of Casa Romantica magazine!